It is possible to play some Nintendo Gamecube and Wii games in VR using an emulator called Dolphin VR. Strangely, some of the games work very well for VR, almost as if they were designed for VR. Although Dolphin VR also works for the Oculus Rift, it works especially well with the HTC Vive (reviewed here) because the Vive’s motion controllers can simulate the Wii’s motion controllers. When the Rift gets Oculus Touch, it will probably be just as capable for emulating Wii games. I’ve tried Metroid Prime 3 with the HTC Vive and it is indeed impressive. You can use the Vive’s positional tracking capability to look around and see everything. Moreover, Samus’ helmet provides an effective anchor to ameliorate nausea (VR developers may want to take note). When I move forward or sideways, I don’t feel any discomfort. 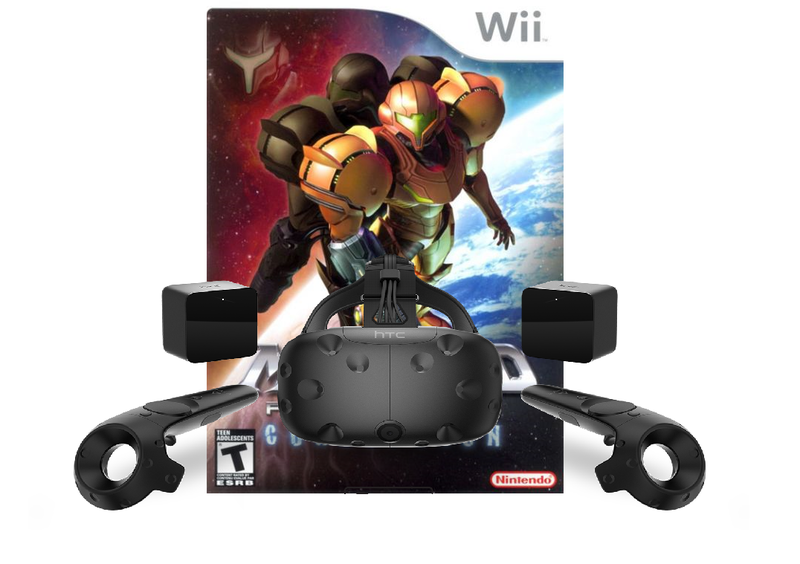 I agree with JoshDub – it’s as if Metroid Prime 3 was designed for VR. One issue is that Metroid Prime 3 is still a seated/standing experience. While you can look around with your headset, or even look behind you, you’re effectively only controlling the camera. Instead, to move, you have to use your controller’s thumbad as the Nunchuck joystick. Your primary controller also acts like the Wii remote, so moving it around changes your point of view and where Samus is aiming her gun. Whereas moving with the Nunchuck was comfortable, waving Samus’ gun around was nauseating for me. Nonetheless, Metroid Prime 3 shows the tremendous potential for using Nintendo games for VR. I really hope Nintendo NX does bring classic Nintendo franchises into VR. 1. Download and install Dolphin VR. 2. Rip the Wii or Gamecube game to your hard drive. 3. Adjust the Dolphin VR settings based on the game. After you’ve installed Dolphin and gotten your ISO in your hard drive, it’s time for step 3. Here are the instructions, step by step. 1. When you launch Dolphin, it will ask you to specify the directory where your ISO(s) are stored. Alternatively, click on the menu Options… Configure… Paths tab and add the path of your ISO. Your game should now appear in your Dolphin library. d. Advanced Settings: use JIT Recompiler. 3. Still in the Config dialog box, go to Wii tab. If you’re in the US, disable use PAL60 Mode. 4. From the Dolphin main screen, click on the Graphics button. optional – change anti-aliasing. This is GPU-intensive. 5. From the Dolphin main screen, click on the Controller button. Under Wiimotes, for Wiimote 1, select Emulated Wiimote then click Configure. Under Device select VR/0/Vive and click refresh. Under Profile on the right, select Vive Wiimote 1A2MP. Click Load. This will change the variables below it. Several lines below Profile, look for Extension. Select Nunchuck. On the right side, under Options, check Background Input. Click OK to go back to the main Dolphin screen. 7. From the Dolphin main screen, click on the VR button. Optional: check Show Controllers if you want your reskinned Vive controllers to show up. 8. From the Dolphin main screen, click on the menu Options… Hotkey settings. a. In the middle, under Reset, click Clear. b. On the right, under Profile, choose Vive RGrip if you are right handed, Vive LGrip if you are left handed. Click Load. 9. From the Dolphin main screen, right click your game, select Properties. In the AR Codes tab, check Disable Culling Outside Camera View. 11. When SteamVR is ready (headset, both controllers, and base stations are all ok), go to Dolphin, select your game and click on the Play button. These are just the settings I used. Feel free to experiment with the settings. If you find better settings, please share them in the comments! I don’t want to play on an emulator on my PC. I want to play it in VR on my TV. Gamecube and Wii games freeze up a lot and don’t run very well on the PC.